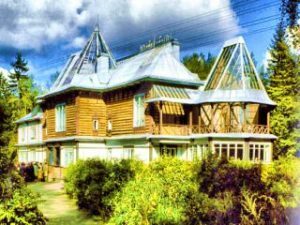 The Museum-Estate “Penates” of Iliya Repin is located at 45 kilometers from St. Petersburg, on the coast of the Gulf of Finland. The world famous russian artist Ilya Repin (1844 – 1930) had spent here the last 30 years of his lie and wished to be buried here. The estate has become one of the country’s first memorial museums under the patronage of the Russian Academy of Arts. The “Penates” suffered hard, during the WWII, and were later restored from the ruines. Here, you can see the personal belongings of the artist, his paintings and drawings, works of his son – Yuriy, and also the works of other Russian artists. Penates keep nearly six hundreds of paintings and graphic works. The house keeps the memorial image of the rooms, which bears the imprint of tastes and habits of it’s owner: a workshop, dining room, patio. The excursion to the museum includes an internal visit to the exposition, viewing the old cinema chronicles, that show Repin in his house, walk to the memorial park and the surrounding area, which inspired many Russian artists and writers. Due to the fact, that the owners of the Penates were fond of vegetarianism, the museum preserved some recipes for those dishes that were served at the famous round table. This excursion is not available on Mondays and Tuesdays.